We’ve been in the plumbing business for a while, so we’ve seen lots of patterns regarding how people react to certain plumbing problems. 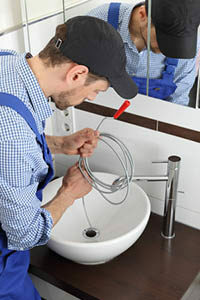 One of the things we’ve noticed, in Greece, NY and throughout the areas where we work, is that people hesitate to call us about problems with their sinks and faucets until it’s a huge problem. We get it. You feel silly telling us that a drip is annoying you or that your water sprays at a funny angle. You may even feel like it’s not a big deal if your sink occasionally leaks underneath or your hot water doesn’t always work. The thing is, little problems like these can become much bigger problems later on. We’d love it if you called us as soon as you notice that something is off with your sink or faucet, whether than waiting until it’s too late to prevent a major plumbing issue. No job is to big or too small for us. We mean that. If something isn’t working, we want to help you get things right. The only way we can do that, though, is if you give us a call when you notice the problem. Here are some signs that it’s probably time to call a plumber for your broken sink or faucet. Your faucet drips. While most people think that a drip is just annoying, it can be a sign that there’s something more significant going on with your faucet. The only want to know is to test it, then take it apart and see how it’s working. If you aren’t comfortable doing this on your own, call us. We’ll figure out why your faucet is leaking, fix the leak, and figure out if anything else is going on that could cause more major problems down the road. Your sink is cracked. When you look at the porcelain or other material that your sink is made of, you shouldn’t see any cracks. If you do, it’s time to call a professional to evaluate the situation. Some cracks aren’t dangerous, but others can mean that your sink is getting ready to break. If this is the case, we’ll help you replace it before it causes more damage in your home. Your faucet sprays water sideways. Sometimes, mineral buildup from hard water can partially block the flow of water from your faucet. This can restrict the flow or send water shooting off in odd directions. If you notice either of these things happening with your faucet, we’ll come out and clean it so your water can flow normally again. We’ll also help you decide if you need a household solution for hard water, to prevent it from happening again. We don’t want you to live in a home that isn’t working well. Give us a call at the first sign of a plumbing issue in your Greece, NY home, and we’ll come find a solution that will work for you.